Amnesia Haze Autoflowering seeds are an autoflowering version of the classic Amnesia Haze Cannabis strain. 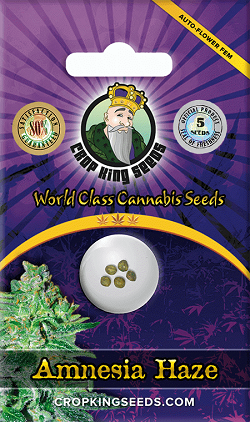 Compact and easy to grow, these auto seeds are ideal for the beginner and more experienced alike, and can be grown both indoors and outside. The plants remain short and compact with close branching. 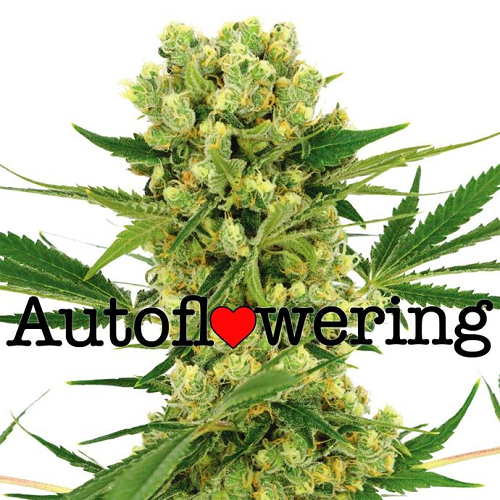 Flowering begins automatically after the third set of true leaves, and the buds will require a further 58 days to completely grow and fully mature. Amnesia Haze autoflowering seeds grow between 65 cm – 85 cm tall, perfect for indoor Sea-Of-Green techniques, or growing discreetly outdoors during the Summer months. Yields of approximately 210 grams per square meter are average. The Amnesia Haze high is mostly in the head. It has a flowery and hazy smoke and it is ideal for a strong yet mellow high. The Amnesia Haze effects are clearly noticeable after approximately 10 – 15 minutes, producing a clear, uplifting, social and cerebral effect, although it doesn’t last long. You can buy Amnesia Haze Autoflowering seeds in packs of 5, 10 and 25 seed packs with prices strarting for as little as $60.00. All these autoflowering Amnesia Haze seeds are feminized, producing female only plants, and are included in the suppliers germination guarantee. Buy the very best quality Amnesia Haze Autoflowering, with free, guaranteed delivery to the Canada, USA and Europe. Buy Amnesia Haze Autoflower Seeds today and receive fast discreet shipping to Canada and all US states.